An illegal alien from Mexico who faces the death penalty for his ambush and killing of two California police officers in October 2014 said during his trial on Tuesday that he only regrets one thing: not killing more American cops. ” “I wish I had killed more of the motherf**kers,” he boasted to the jury. 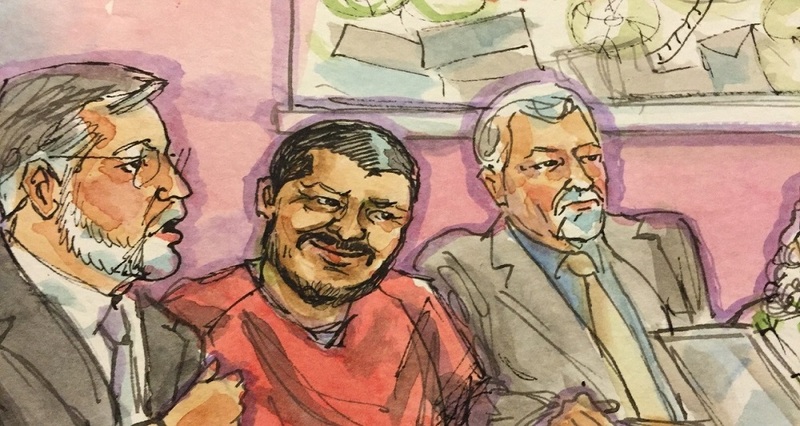 The illegal alien cop-killer appeared to be having a jolly time in court while survivors of two cop-killed by the suspect had to hear the details of their loved-ones’ deaths. Luis Bracamontes, a 37-year old illegal alien, who had been arrested and deported numerous times in Arizona, went on a crime spree in Sacramento, California that ended with two police officers killed. A Northern California police sergeant told the Conservative Base editor that Bracamontes is on trial for the cop-killings and faces the death penalty and his wife, Janelle Monroy, could spend the rest of her life in prison. Sgt. Stan Burke claims that Bracamontes lacked any semblance of regret or remorse and yelled in the courtroom that he will escape and kill more people. He also accused one of his police victims that he killed of cowardice. His defense lawyer tried to make the defendant’s sanity an issue and he admitted in open court that his client was responsible for the deaths of the two police officers. He claims he possesses evidence with which he hopes to save his clients. Bracamontes was alleged high on methamphetamine when he committed the murders. Known on the streets as “crank,” “speed,” and “meth,” methamphetamine is a powerful stimulant of the central nervous system that has resulted in erratic and violent behavior. He’s charged with being “stoned” on meth and shooting and killing Sacramento County Deputy Danny Oliver and Placer County Detective Michael Davis in October 2014. The deputies were gunned down during a multi-county chase that began in Sacramento and ended south of Auburn, California. There were several shootouts during the chase. These threats by the Mexican national led to presiding Judge Steve White order court officers to remove the jury before he warned Bracamontes he could be removed from court. “The news media once again showed their true colors: they couldn’t talk enough about President [Donald Trump] calling countries such as Mexico ‘sh*tholes,’ but an illegal immigrant calling cops he killed and would like to continue killing ‘motherf**kers’ was ignored. Those members of the press who did cover the case failed to mention the killer was a Mexican illegal alien,” said James L. Daugherty, a retired homicide detective.